The idea of performing vocal music in the vernacular (for English speaking listeners) is understandable. Often listeners, in whatever linguistic category, have felt that going to the opera house and hearing an opera sung in a foreign language, has alienated them from a deep experience of the work, and until a few decades ago operas regularly were translated. Today with surtitles in the vernacular – or in some of the most prestigious houses with the option to choose language – the problems have diminished. Listening to vocal music on records is also facilitated through the texts printed in the booklet with translations, but obviously there is still a need to hear the music in the vernacular – the success of Chandos’s “Opera in English” series is proof as good as anything. There are still problems of course, insofar as a lot of linguistic skill and feeling, combined with musicality is required to weave together words and music to a homogenous entity. Not all the Chandos issues have been free from reprehensibility in that respect. When it comes to translations of art song poetry the difficulties are even greater, the translator having to weigh every word. Müller’s original words in Winterreise are so well-known by millions of music lovers, that at least some connoisseurs react to changes of vocals, which is unavoidable in some cases. I may not be one of those, but having heard the cycle on numerous occasions I know what to expect. Some 40 years ago baritone Håkan Hagegård recorded Winterreise in a translation to Swedish by the celebrated poet Bo Setterlind. He was known for his musical language, having also translated the libretto for La bohème very successfully. The recording, originally a production for Swedish Television, has long been one of my favourite Winterreise, and I still feel that the poems fit like a glove to the music. Non-Swedish listeners will probably feel confused, even though it can be enjoyed for purely musical reasons. Concerning Jeremy Sams’s translation into English I found it congenial: it follows Müller’s texts very closely, it rhymes very beautifully and it doesn’t feel laboured – it fits naturally like a glove and I didn’t have a sense of listening to – and reading – a translation. The words seemed woven to the music as much as Setterlind’s Swedish words to the same music. Through Roderick Williams’s exemplary enunciation and unfussy delivery I felt I was listening to the original. Unfussy is also a proper word for his interpretations at large – which doesn’t exclude a high degree of sophistication and expressivity. Basically it is a lyrical reading, restrained, tasteful but full of emotions. There are some well-judged dramatically intense moments: The Weather Vane (tr. 2), parts of The Linden Tree (tr. 5), parts of Dreaming of Spring (tr. 11) – key moments where a happy past and a not so happy present clash – but even here he works on a small scale: he doesn’t cross the T and dot the I, as the jargon goes. He uses small print – and this is one valid way of singing this cycle. The opposite is John Elwes’s high-strung expressionist reading (review), which I described as “almost psychotic“ in another review. There is room for both extremes of this inexhaustible work – and a lot of other approaches in between. 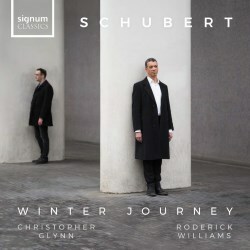 Roderick Williams’s winter traveller is an inward character, speaking to himself with no big gestures and restrained facial expressions – or so it seems when just listening to him – but his careful use of nuances are so much more telling and expressivity can be achieved without histrionics. Just listen to how tangible the pain is expressed in Loneliness (tr. 12). Likewise the change of state of mind in the following The Post: He is joyful at first, his heart even misses a beat, but then, sadness: “You know, there’ll be no post for you / Stop pounding, like you always do / My heart, my heart.” This song, in spite of all the disappointment, is the last glimpse of hope. Nay, there is a short moment of defiance in Courage (tr. 22), but otherwise the second half of the cycle is a tragic journey towards the unavoidable end, and this is so touchingly expressed in, mostly, very soft nuances. But in the midst of this tragedy the beauty of the singing is there as a consolation. The shadows become darker but the contours are still possible to perceive. It is an utterly touching reading. Let me just add that Christopher Glynn is a superb accompanist: his precision, his flexibility, his involvement are essential ingredients in the totality. Those who have been longing for an English version of Winterreise need not hesitate, and avid collectors of this song cycle – like myself – will find that this is a valuable addition to their collection.